[PDF] Tietz Fundamentals of Clinical Chemistry, 6e (Fundamentals of Clinical Chemistry (Tietz)) | Free eBooks Download - EBOOKEE! 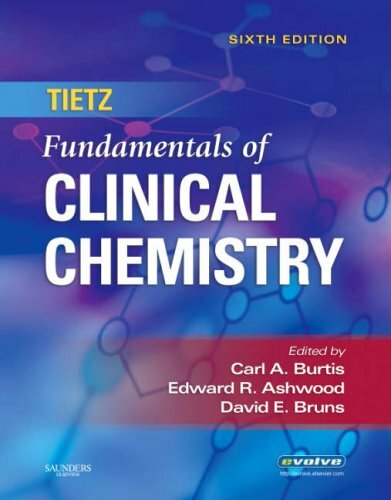 Description: Product Description: A condensed, student-friendly version of Tietz Textbook of Clinical Chemistry, this text uses a laboratory perspective to provide you with the chemistry fundamentals you need to work in a real-world, clinical lab. Accurate chemical structures are included to explain the key chemical features of relevant molecules. Offering complete, accurate coverage of key topics in the field, it's everything that you expect from the Tietz name! * More than 500 illustrations and easy-to-read tables help you understand and remember key concepts. * Key words, learning objectives, and other student-friendly features reinforce important material. * Chapter review questions are included in an appendix to test your knowledge. * A two-color design makes it easier to read and easy to find important topics. * In-depth, reader-friendly content is appropriate for MT/CLS and MLT/CLT students and may also be used by laboratory practitioners, pathology residents, and others. * A new chapter on newborn screening discusses the basic principles, screening recommendations, inborn errors, methods, and interpretation of results. * A comprehensive glossary provides easy-to-find definitions of key terms. * An Evolve website provides regular updates of content, answers to review questions, and web links to related sites for further research and study. No comments for "[PDF] Tietz Fundamentals of Clinical Chemistry, 6e (Fundamentals of Clinical Chemistry (Tietz))".